Self-harm is when someone deliberately injures or damages themselves. Often this leaves a mark, a scar, draws blood or leaves a bruise. The most common ways of doing this are cutting, scratching or pricking to draw blood; burning, picking at old wounds, punching or head-banging a wall. All kinds of people self-harm, but it's most common among 15-19 year olds. It's not known exactly how many people self-harm, as it's often hidden. What should I do if I self-harm? You don't have to keep it secret or let it rule your life. Talk to someone today. Start with your GP or one of the organisations on the panel on the right. Even a friend or a teacher. The most important thing is that you tell someone, so you can start to get better. There is a website for young people, in Bexley and Greenwich called Headscape, which has been set up specifically for young people in the Borough. It is a 'one stop' source of self-help about a range of mental health issues and conditions to browse and get help if needed. Try doing something else when you get the urge to harm. Get outside and do something different, or reach out to someone to take your mind off it. Learn to spot when the pressure is building up. Understand that everyone has times like this and that you deserve a gentler way of dealing with it. Install a punch bag. Beat up a pillow. Squeezing an ice-cube or flicking an elastic band works for many people. What if one of my friends self-harms? The most important thing is to be accepting and not judgemental. Offer to listen if they want to talk, and gently try to persuade them to get professional help and not to keep it secret. But remember, it's not your fault if they harm and you mustn't feel guilty if they carry on. Don't join in. Peer pressure is a powerful thing. Self-harming is good for nobody and the marks last forever. The reasons people self-harm are often misunderstood. It isn't about attention seeking or wanting to die - but it can be a cry for help. 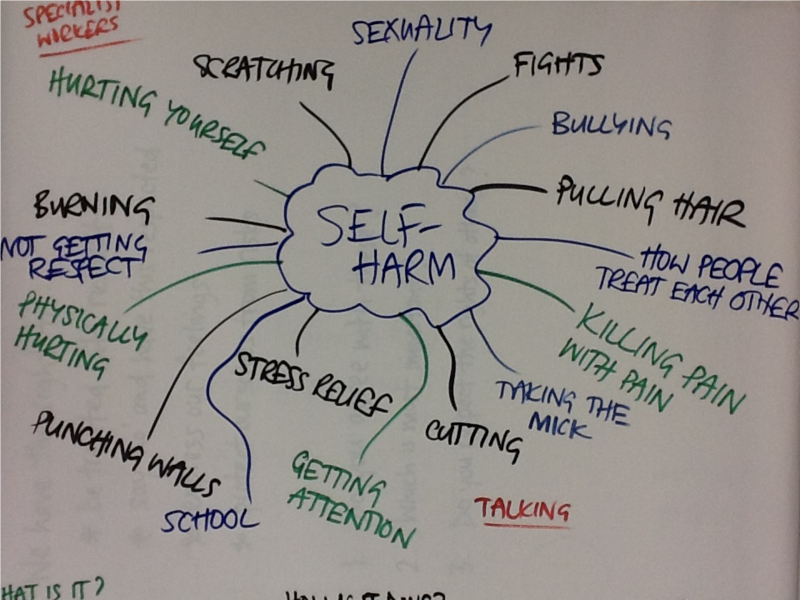 Most people who self-harm have been through bad experiences in life like bullying, abuse or bad family relationships. It leaves people feeling bad about themselves, and as pressure builds up, self-harm can feel like the only way of dealing with it. Sometimes a physical pain provides relief to emotional feelings. Some people may want to punish themselves because they feel guilty or worthless. Or that the harming acts like a pressure valve, allowing them to relax. Self-harmers usually want to stop, but don't know how else to cope. They may not know how to express emotions, or perhaps there is a belief that they're bad and deserve to be punished.